Sharadiya Shishu Sathi in 1347 ebook pdf file. All my dear little blog reader, this nice evening I want to share with you an old but very sweet yearly Pujabarshiki magazine. 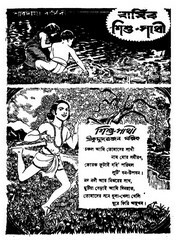 Do you want to know, what is the name of magazine, yes it is Sharadiya Shishu Sathi in 1986 (1347 BS). If you want to read this old version magazine, please follow the link below.